New sea glass and sea pottery jewellery. 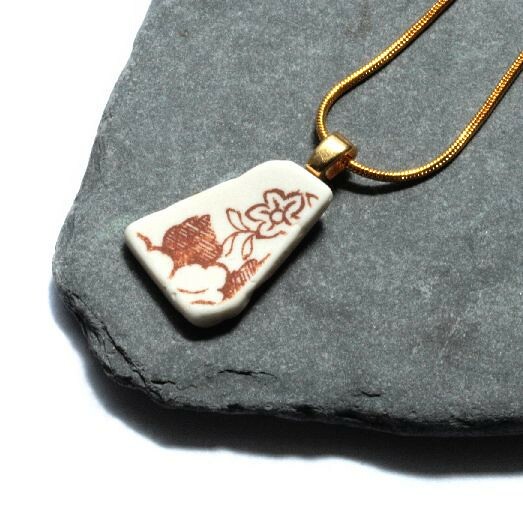 I love finding patterned pieces of pottery like this little brown flower and even have a pretty patterned piece waiting to be used which has a little brown dog on it! Today has been mainly computer based but accounts and website have been updated; I have had to fix a very dumb error as on the bottom of every page of website is a copyright notice but, thanks to the Google webmaster tool, I realised I'd forgotten the 'y'. Now copyright is spelt correctly! Phew. Recycled bezel set sea glass is happening in an experimental fashion and I'm just waiting on a back order of solder to appear in the arms of our cheery postman, then I'll show you how it is working out, hopefully soon!